Welcome to another end-of-the-week update from your friendly dev team at CSE. We remain busy as always, continuing our countdown to the start of Beta 1 (July 4th is coming!) as we work through all our to-dos. As our team has grown, so has our ability to work on more things at the same time–put more pots on the stove, if you will! We covered a bit of everything this week, from gathering design, to scenario gameplay needs, lots of testing, buildings, animation improvements, and still had time to continue our open and honest communication through our livestreams and updates! Additionally, we’re excited to open up testing this weekend to IT, Alpha, and Beta 1 folks. 12PM EDT – 3PM EDT/9AM PDT – 12PM PDT/4PM UTC – 7PM UTC. If you’re confused about the times, you can go HERE. We’ll have another follow up email going out with more info as well. If you missed today’s end of the week update and Q&A with Mark, you can catch that HERE. Let’s move into this week’s highlights and art! Testing: This week, Tim spent time streamlining our process to bring up new shards, greatly reducing the amount of time required! We created Nuada and Hawking this week, and both were immediately used in this week’s testing, which was overseen by Brian. These extra shards will allow us more flexibility in testing as we move closer to the start of Beta 1. WIP – Design – Gathering: Mark has been hard at work on gathering, both design for gathering within the game and “gathering” new hires for the team (recruiting) as well! This morning he was heads down in his “gathering calculator” working on the details of materials gain, item degradation, and exactly how long it should take to level a basic gathering skill to soft cap. WIP – Tech – Server Spin Up/Down: Server reliability is always important, and more so for the start of Beta 1. This week, Colin dropped in several fixes to improve the process for bringing zones online. The next task will be gracefully handling zones going offline to reduce impact for those players online. Tech – Resource Node integration with ECTs: Courtesy of Christina, and mentioned in last week’s stream, resource nodes can now be spawned though the ECT system, which means Design has more control over where resource nodes are placed, how they are configured, and have the ability to use them in scenarios. Also, resource nodes are displayed on the mini map for now, primarily for testing. Tech – Repair Item Skill Node: Also from Christina, there is now skill scripting support for repairing items that have been dropped in the world. Design will now be able to build out the skill parts that players can use to create these repair skills in order to fix up siege engines, voxen, and building-placed items. WIP – Tech – Improved Account Access Security: JB has begun work on a lengthy task for a new authentication system for the game and the web API, which will replace our current login tokens. This will give players more secure access to the game, account management, and the API. This will also be used to allow users to create and give out API Tokens to third-party applications to safely and securely give customizable read-only access to character info. WIP – Art/Tech – Updated Health Bars: AJ has begun work on the updated styling to the health bars previously provided by JB and James. AJ has also fixed several UI bugs this week that shook out of recent testing. 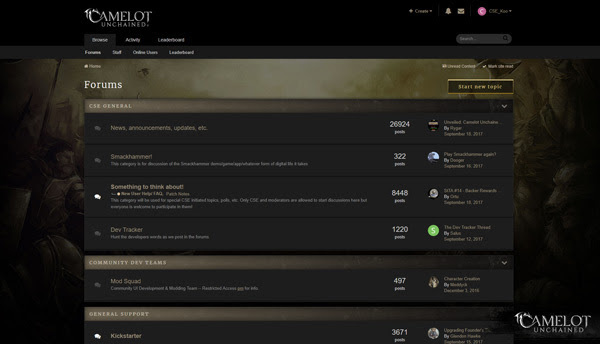 WIP – Art/Tech – Updated Forums: Charles and James have been working on an update to the forums. James is currently working through the styling update to the forums before testing and deployment. WIP – Art – Ability SFX: dB has mostly finished re-hooking up ability SFX after our ability XML refactor. Now that there are more sounds going off, he’s working on performance, mix, and voice limiting issues. WIP – Art – Ability VFX: Mike as well has mostly finished re-hooking up VFX to the starter abilities, including some cosmetic improvements along the way. Next, he will move on to improving the look of the VFX based on Michelle’s concepts that give each Realm their own visual look for each damage/element type. WIP – Tech – Ability SFX/VFX Audit and Baseline: Rob has been the primary supporting engineer helping Mike, dB, and Ben get VFX and SFX working on all the starter skills. He’s now working on a full audit of the starter skills to make sure everything is working, and is pushing a “baseline” off to its own branch for later comparison when debugging. WIP – Art – Characters 2.0: Jon finished the TDD medium armor update this week and began work on the heavy armor. This work greatly improves the visual fidelity of our characters while making better use of our poly budgets, which is extremely important to support our very large-scale battles! WIP – Art – New Ability Animations and Class Idles: Joe completed a new Stonehealer unique idle as well as the new Crushing Annihilation ability animation. Scott finished the Empath unique idle, and is working through a second pass of the Agonizing Remembrance animation to wrap up early next week. Sandra is working through a second pass of the Forest Stalker’s Overgrowth Shot to add more “pizzazz,” after some good input from Ben. WIP – Art – Scenario 2 Environment Assets: Work continued apace this week on the many assets needed in this map. 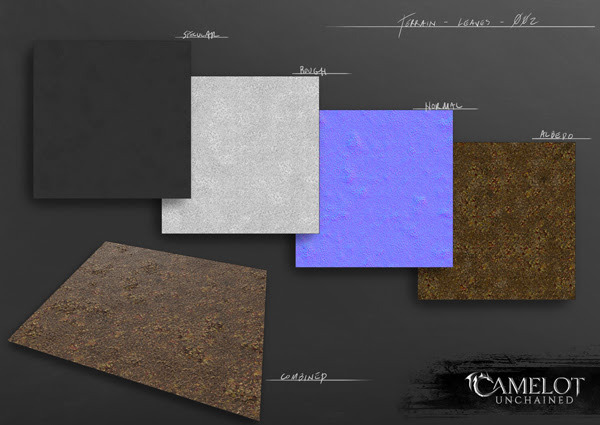 Tyler finished the first pass of the center terrain mods and tertiary assets. This also included finishing a set of new ferns and rocks from Dionne. Speaking of which, Dionne finished a first pass of new ruin assets which replace much of the placeholder grey box assets in the zone. I (Tyler) especially like this week’s list, as there’s a lot of fun, very game-centric items in here. Plus, we’re taking this opportunity to reduce our artistic scope for the start of Beta to focus on some core weapons and abilities for improvement passes. This work can then help better define the look and feel of combat animations, VFX, and SFX, when we go wide again in more weapons and abilities during Beta 1. So, speaking of the look of the game, let’s get to some art from this week! 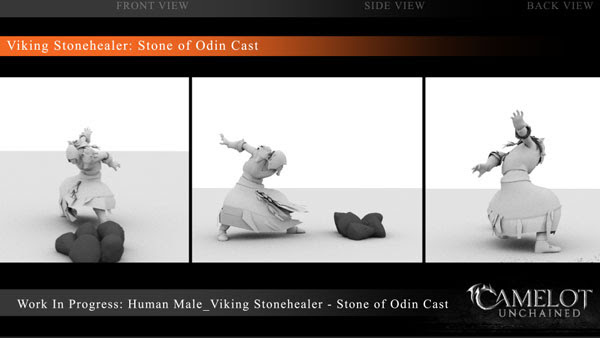 First up, we have the promised WIP video from Joe, our new animator, on the Stonehealer’s “Stone of Odin” ability. Of special note here is the rocks Joe has placed around the Stonehealer. Right now this is to convey the concept of how we’d like the animation to work. We still have some technical dependencies in the way before we can fully realize this. For the start of Beta 1, our goal is to use the tech we have to get as close to this idea as we can. Consider this still very much a concept, and a WIP. 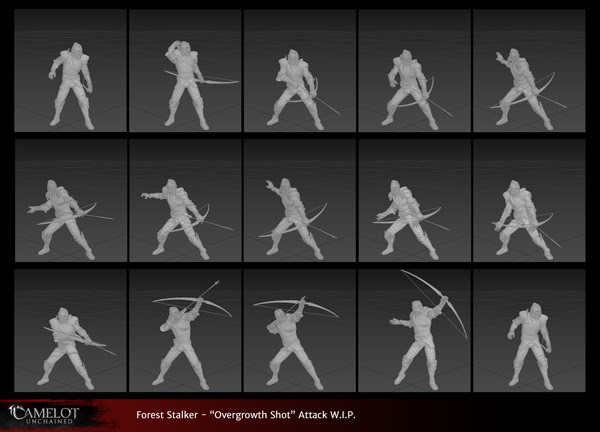 Next up, we have a static image of some of the animation work Sandra is doing on the Forest Stalker’s “Overgrowth Shot.” In this ability, the Forest Stalker summons life energy from the area around him, adding that to his arrow before launching it skyward. I, Tyler, have continued to be busy working with Dionne on new environment assets to be added into Scenario 2’s zone. This week, we pushed Ben’s simple art pass of the zone over to another server (Nuada), so I could begin adding in all the terrain mods and hand-placed assets to the zone without affecting testing. This week, I finished off a couple of new terrain mods and began work on a secondary set, including leaf and fern terrain and assets. These two images are out-of-game renders, using real-world asset scans to create the terrain. They still need some work to reduce repetition, but work as first pass assets to begin new mods. Next, we have a shot of the new styling, from James, that will go with the Backer’s forum update. 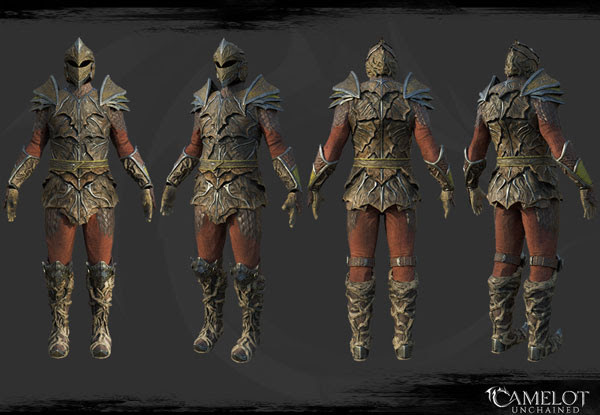 Despite getting sick early in the week, Jon was still able to finish the update of the Tuatha’s medium armor. Dionne continues to build out assets for our second scenario, Dragon Fang. This week, she worked with a bunch of photogrammetry scans of ruins and reduced their texture needs, something always important to remember if we want to support our battles of over 1000 players. For concept art this week, Michelle took a second pass at some of the ability visuals to further differentiate them from one another. One of our primary goals for the game’s visuals is to make sure players know what is going on during a large-scale battle. 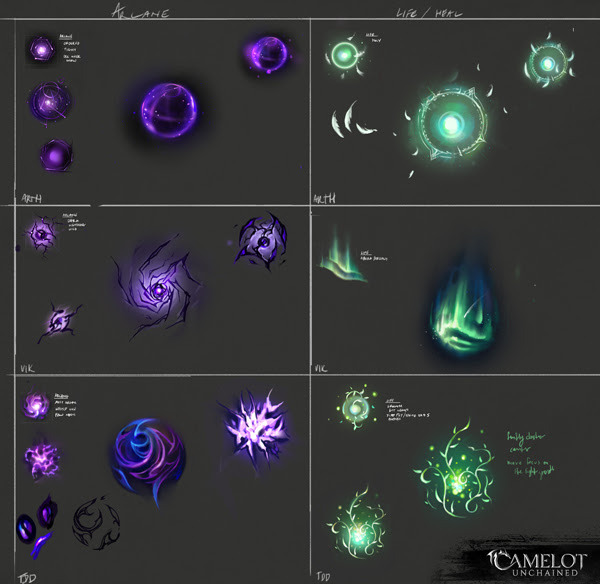 We hope that if each Realm has its own look for say, arcane magic, it will help overall combat readability. During Michelle’s stream this week, which you can view HERE, she continued work on ideas for assets needed in the Dragon Fang scenario. That’s a wrap for us at CSE this week! Lots of continued progress as winter loses it’s grasp on the weather here in Fairfax. We’re all looking forward to an exciting summer (minus the pollen) full of delicious Beta 1 goodness.